This is the first community-run project of its kind in the world: Mikoko Pamoja promotes the restoration and protection of mangrove forests for local community benefit. It is validated by Plan Vivo to generate and sell mangrove carbon credits to companies and individuals, who would like to improve their green credentials. The revenue generated from the trading of carbon credits flows into a community benefit fund, which is managed by the community-led Mikoko Pamoja steering group. The fund supports local development projects in education, water and sanitation, and mangrove reforestation. Due to the high emissions from the forest sector, the UNFCCC developed carbon conservation incentive schemes to enable financial compensations for good forest management. For communities in Kenya to earn funds through carbon projects, necessary legislation has to be in place. The Forest Act (2005) enabled the formation of Community Forest Association (CFA) at Gazi Bay, which was followed by the signing of a forest management agreement between Kenya Forest Service (KFS) and the community. The management agreement stipulates the allocable community activities in the forests and enabled the Mikoko Pamoja Community Organization (MPCO) to engage in the sale of carbon credits. The agreement provided an ownership of a designated area of mangroves of Gazi Bay to MPCO (approx. 117 ha) in which various project activities, including community education and awareness programs, are carried out. The collaboration with the Kenya Marine and Fisheries Research Institute (KMFRI) provided the necessary technical know-how needed for the carbon assessments and development of reference emission levels. Through Mikoko Pamoja, the community has a powerful mechanism to generate revenue, which is benefiting community projects in health, education and mangrove management. Restoration efforts of lost mangrove areas increase the amount of carbon that can be stored and together with the enhanced restoration and protection of mangroves a total emission reduction of 50,000t CO2 is expected over the next 20 years crediting period. In addition, healthy mangroves are nursery grounds for fish, ensure shoreline protection and support sediment stabilization. 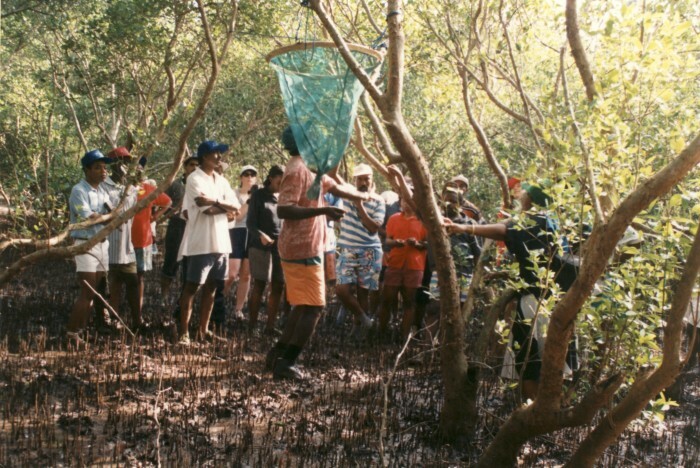 As the project has a strong ownership by the local community it also leads to improved education standards and enhanced awareness for the importance of healthy mangroves among the community. The success of Mikoko Pamoja is being replicated in Kenya’s south coast at Vanga and across the Western Indian Ocean countries in Madagascar, Tanzania and Mozambique. Mikoko Pamoja is all about the community living in harmony with a natural mangrove environment. It is the first ever community-type forest to trade and benefit from sales of mangrove carbon credits. Some of the poorest people on earth rely on the mangrove forests that fringe the Kenyan coast. Bridging the sea and land, mangrove trees provide storm protection, feeding grounds and nurseries for fish, as well as harvestable wood products, such as firewood. And mangroves offer another service to the globe: even more than terrestrial forests, they fight climate change by sucking carbon out of the air and storing it safely underground. The capacity of mangrove to capture and store carbon has been estimated at 3-5 times higher than any productive terrestrial forest. However, 30–50 per cent of all mangroves globally have been cut down or burnt in the past half-century, placing them among the earth’s most threatened ecosystems. Considering the value of these coastal forests, their continuing destruction is one of the world’s great market failures. 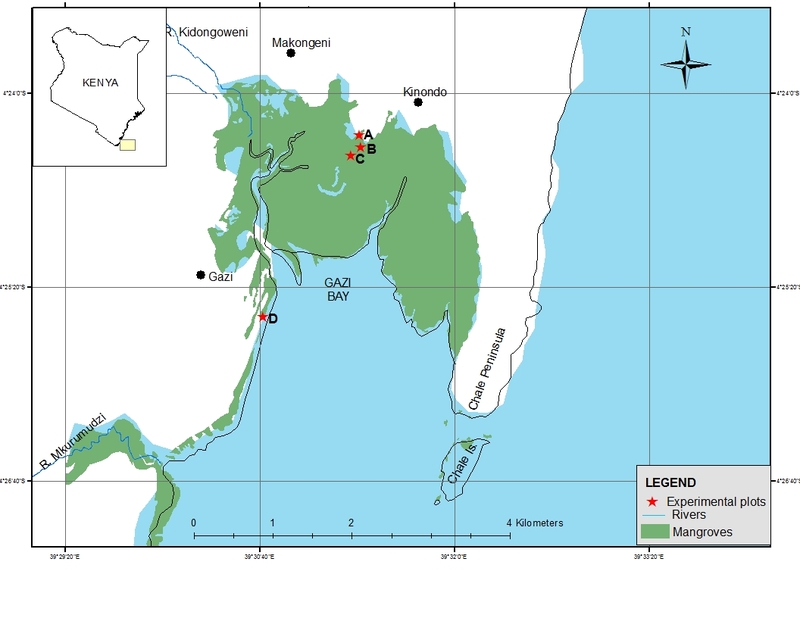 Centered in southern Kenya’s Gazi Bay, researchers have explored new ways to demonstrate the mangroves’ worth and tap their carbon storage potential to benefit poor coastal communities. Earlier work in Gazi Bay, led by James Kairo of the Kenya Marine and Fisheries Research Institute and Mark Huxham of Edinburgh Napier University, demonstrated how to restore cleared mangrove stands — even in areas where salty stumps have stood lifeless for 40 years. Now, the team is collaborating with an international ‘carbon credit’ scheme to sell the carbon storage created through mangrove reforestation and conservation. Small, community based projects — in Kenya and worldwide — could fit into the UN’s programme for reducing emissions from deforestation and forest degradation (REDD). Researchers and Kenyan forest managers are discussing steps to turn vulnerable mangroves into profitable REDD sites. Using lessons from Gazi Bay, many more communities could reap increasing value from healthy coastal forests. The success of Mikoko Pamoja is being replicated in other parts of Kenyas coast and the Western Indian Ocean region. 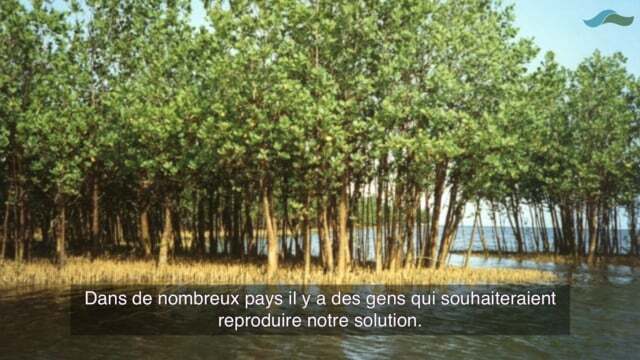 This solution is published in the Marine and coastal , Ecosystem-based Adaptation and Protected areas portal.